Not every woman can afford to isolate herself during her period, due to the nature of our active lives and the daily demands on us. But what we can do is envision for ourselves an inner temple, build a sacred space that we carry with us into our day, whether with family, at work, or social events. This is a useful technique for women undergoing peri-menopause, when periods start to get irregular, and hormonal changes bring hot flashes, palpitations and night sweats. During peri-menopause, I gained a new appreciation for the complex physical and emotional dimensions of my period. I started taking more naps, feeling the need for more quiet time. Making time to be alone is not easy, so use this visualization technique to create a space of protection for your inner feminine realm. The portable moon lodge allows you to maintain a deep inner connection to your body, and establish a feeling of sacred space. It’s a useful technique for centering yourself while in an activity. You will feel different when you listen and honor your body-mind connection rather than denying your cycle and or it's disruptions. 1. With your mind, spin a protective veil or shawl around you and imagine an indigo blue mist as an energy curtain that separates you from the outer world. 2. See the blue light circle you and stretch out four feet in all directions. Breathe in the cool colour, which magically deters all energies you want to keep away. Allow the quiet to envelope and soothe you. You are in your retreat space, a space of intention within your own Moon Temple. 3. In this moment, feel gratitude and appreciation for your body and its ability to cycle. Feel your own rhythm. Even if you experience cramps, fatigue or discomfort, summon the wise woman within and stay grounded in appreciation for your body. Know that the body always moves toward healing and regeneration, and that the energy of appreciation is healing and restoring. 4. Awaken to inner listening – what does your body need? This is your sacred duty, to remain grounded, with the body, aware. 5. In contrast, remember a time when during some intense activity you ignored the needs of your body, whether thirst, hunger or discomfort. You wanted to finish one more email, complete a report, engage in a conversation. Hours passed and you ignored the simple body needs of your physical being. Ask yourself, is that ragged, tired feeling what you really want to create for yourself, or model for your daughters and sons? 6. Now, focus within, while you are mindful of daily activities. It is your job to hold your energy tightly around you and not allow it to leak out. If, with your strong desire you envision containing sacred space, the universal forces will line up in support. Maybe you’ll end up having lunch alone, or skipping a stressful meeting. 7. Feel the nourishing feeling of self-care, in spite of outer circumstances. Your job is to feel the joy of this connection and envision what you desire. 8. Allow any resistance to come up. See your life with objectivity. See the stress and pressure and choose to make a declaration to deepen your commitment to self-care. There is no honor in martyrdom of your body. 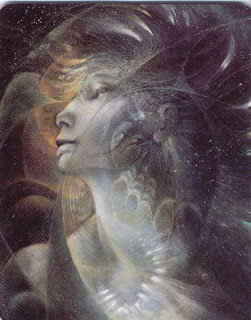 You, by your connection to all women, all that is female and Mother Earth, are a guardian of the Sacred Feminine. Beyond the veil of soft cool indigo curtain, see the web that connects you to your family, your relationships, the plants and animals, all life. Taking care of this body temple during your cycle (and during menopause) is a show of strength. Know that if you make an intention to create this blue cocoon/shield to honor your sacred moon flow and meet the physical needs of your female body, this act of power will translate to all areas of your life. Breathe deeply and feel yourself restored and enlivened. borrowed from: Tamara Slayton, Reclaiming the Menstrual Matrix (as paraphrased from Women’s Rites of Passage).